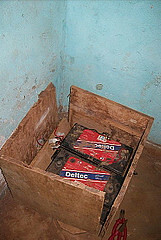 After 3 years of lighting the orphanage so the children could do their homework etc the deep cycle batteries have given up. They cost £150each and we have enough money saved up through your giving to buy one. We will keep saving until we have enough to buy all three that are needed for the whole system to be refurbished.